Rosie when she first arrived. Marleen encourages Rosie to stand. 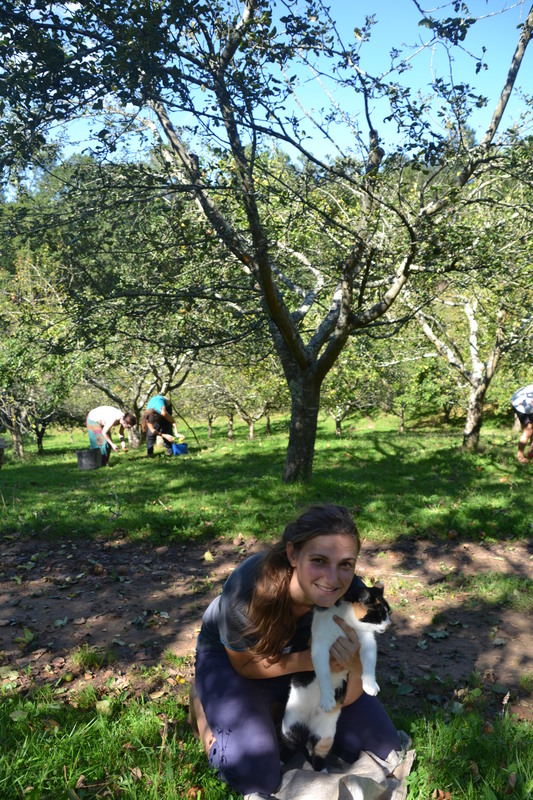 Saying goodbye to Rosie was hard for me; writing about her isn’t easy either. She meant a lot to all of us. Four years ago we collected her from a place where she had nothing: no food, water, cover or care. Due to long-term neglect she was forced to step on the front of her hooves, which meant that she couldn´t move at all. Also she was infested with fleas. Our farrier made her special irons with high heels and her feet were encouraged back into normal position slowly, bit by bit. Slowly also, she regained her confidence in people. Years passed in which Rosie enjoyed her life in the Donkey Paradise. Gradually, walking became more difficult for her, yet she liked to walk up the hill to graze every day. 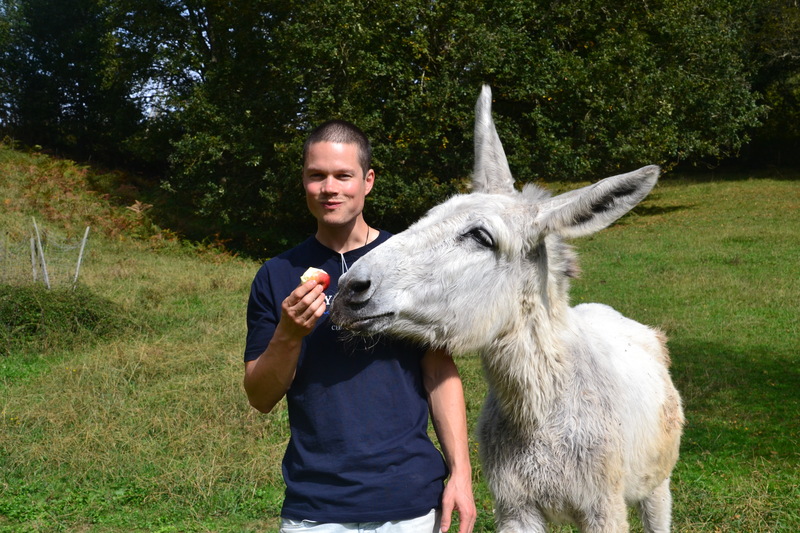 Last summer she became the emblem of Ian and Louis´s action ´Caring for Rosie´, which raised 1600€ for all the donkeys. A fantastic result! 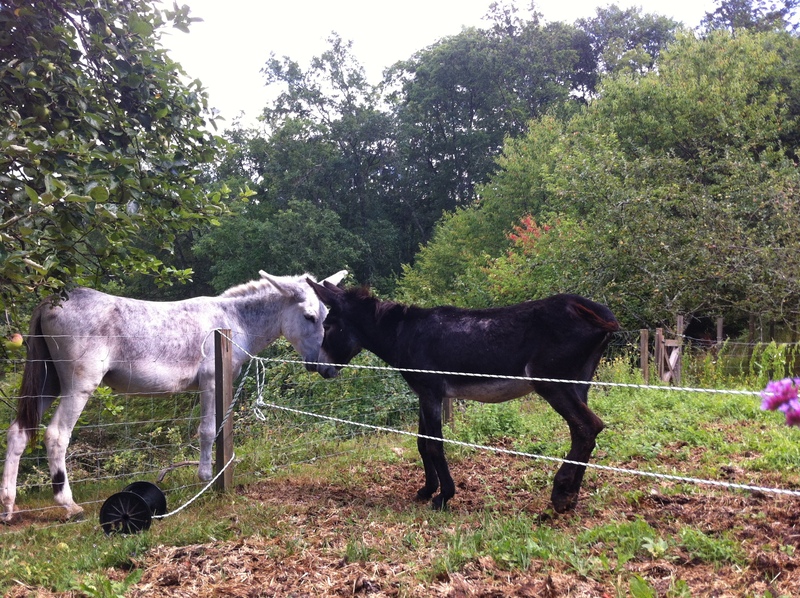 When donkey baby Rocco arrived, Rosie was appointed to adopt him, because he lost his mum too early on. She did that with increasing patience and commitment but her feet and legs started to give her more and more pain. In the end she stopped walking altogether and just spent her days in the yard. When she also stopped eating with pleasure, we knew it was time for her to go to the real Donkey Paradise… She didn´t go alone, though, for much love from all the volunteers accompanied her. Rosie will never be forgotten. So slowly you went on your way. And your urge to escape and discover. So softly, softly you went where you were called. And with many sweet memories of you. Stevie, the cute little pig who recently came to live at the Donkey Paradise, now has a wonderful outdoor pen, built by the volunteers, in which she can snuffle about, feel the fresh air on her skin and enjoy her new freedom. Before she came to the Donkey Paradise, Stevie only had a small, dark, interior space as her home. When she first went out into her new enclosure she was very afraid and squealed “like a pig” all the way. She wears a halter to walk to her pen and then, at night, she returns to her indoor shelter. She still squeals whenever she has to go out, but now it is happening less and less as she learns to adapt and enjoy her new environment. Just two months ago, Bella, a large, scared, sick mare, was rescued from neglect. She was under-nourished, nervous, nearly blind and lacking care in her sad, sick, state. Good fortune finally found Bella, when she was taken in by Marleen to sanctuary at Donkey Paradise where love and care awaited. She was given her own stable, clean water, nourishing food, good grazing, veterinary care and the human kindness she deserved. Although she remained aloof to other animals, preferring to graze alone, slowly she built her trust back in humans to allow the care she desperately needed. Simone devotedly treated her hoofs and suppurating wounds: regularly and lovingly cleaning, treating, dressing and binding. Her big brown eyes, clouded with cataracts and weepy, were gently washed. This week the hard decision came as she lay down unable to rise one morning: Bella’s once strong body now so frail. The time was now due to relieve her from anymore suffering. She was put to sleep with Simone by her side, and slipped away peacefully at Donkey Paradise. 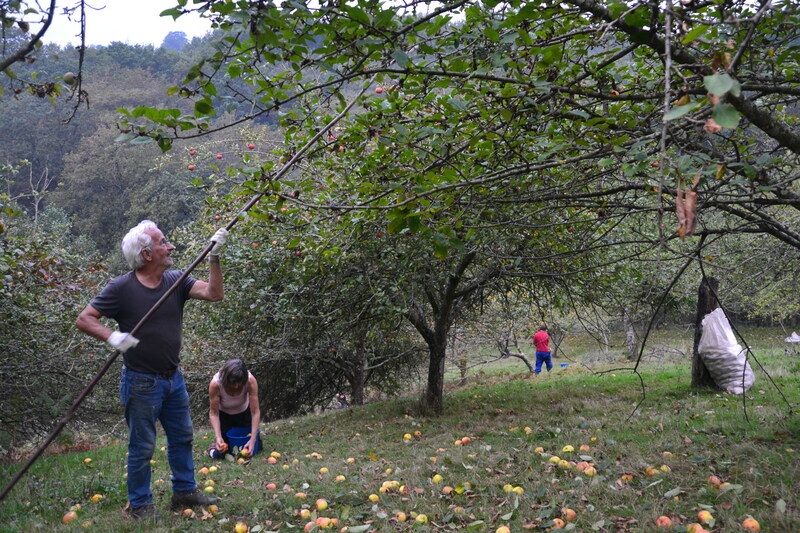 A yearly recurring event is the autumn apple harvest, as the land of the Donkey Paradise has lots of apple trees with cider apples. 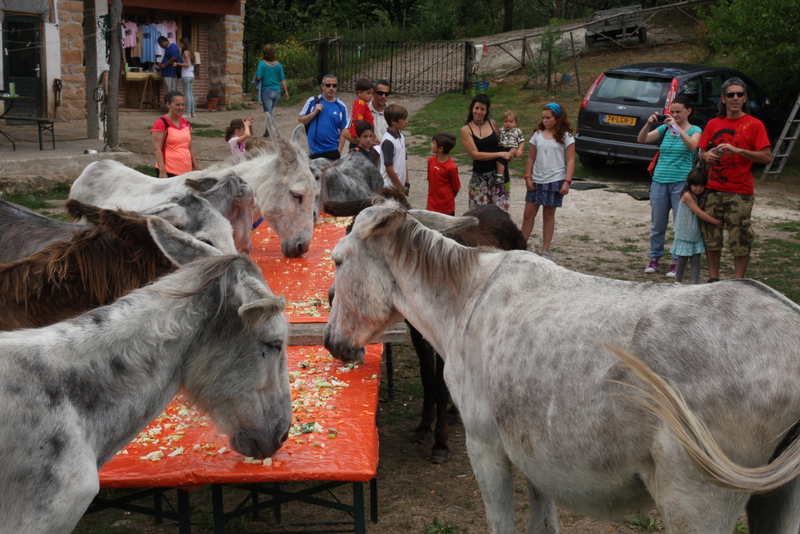 It’s not always easy to carry out all the donkey-related tasks ánd collect all the apples, but this year we were fortunate enough to have a lot of helpers. 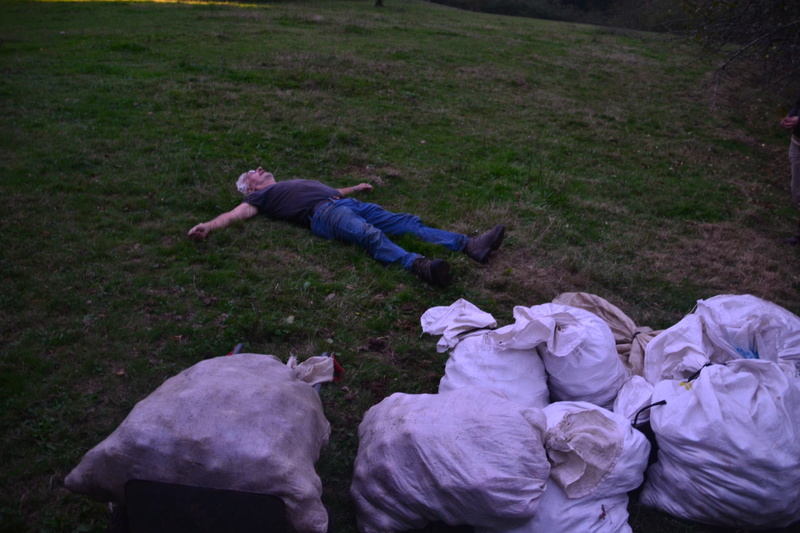 They had to shake the apples from the trees and put them in 30-kilo bags. 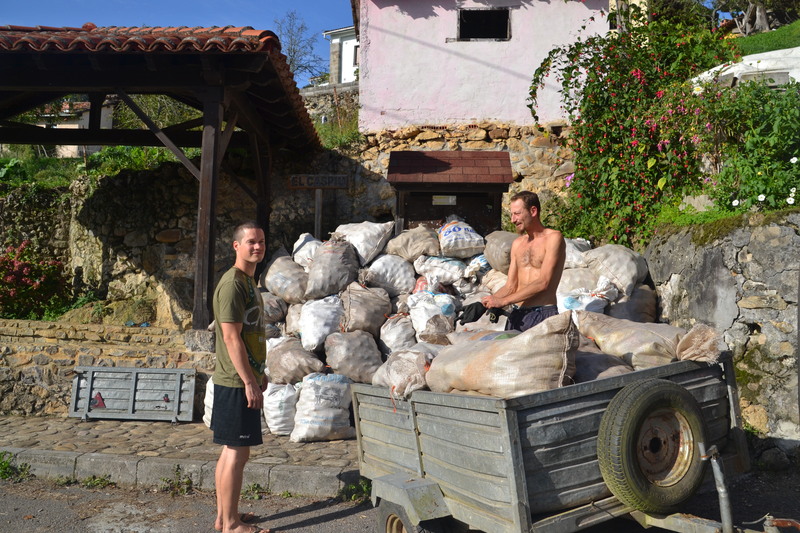 These bags will then be taken to the village, where they are collected by the truck from a cider factory in Nava. 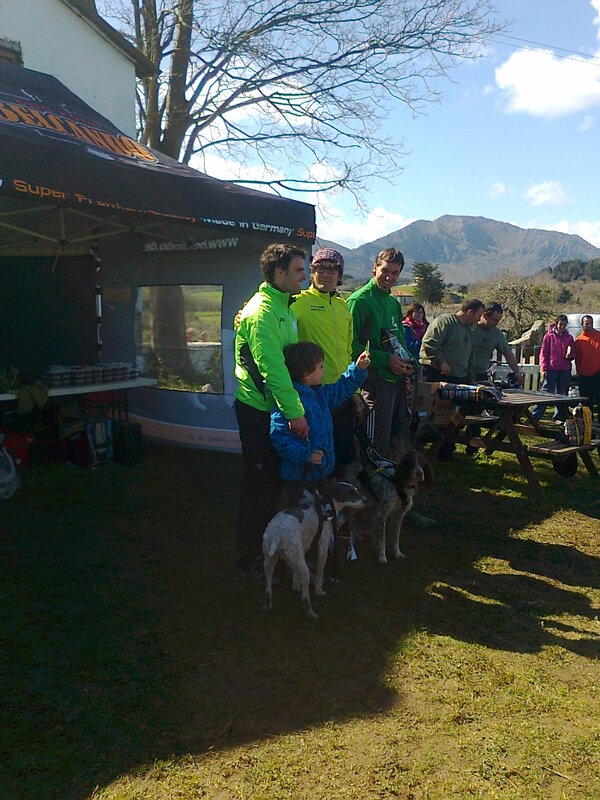 Thanks to the enthusiasm of the helpers and the warm weather we were able to collect 10.000 kilos! The money is used for necessary reforms of the buildings. 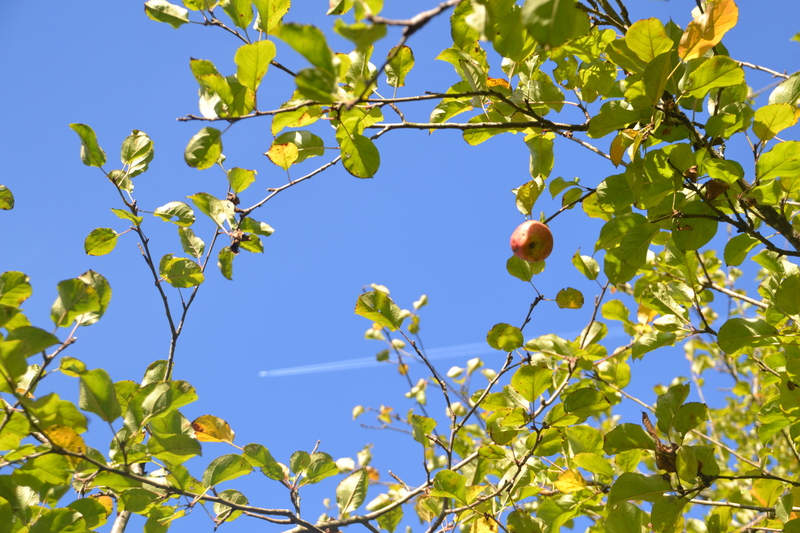 Perfect weather for picking apples. Time to give Canela a hug. 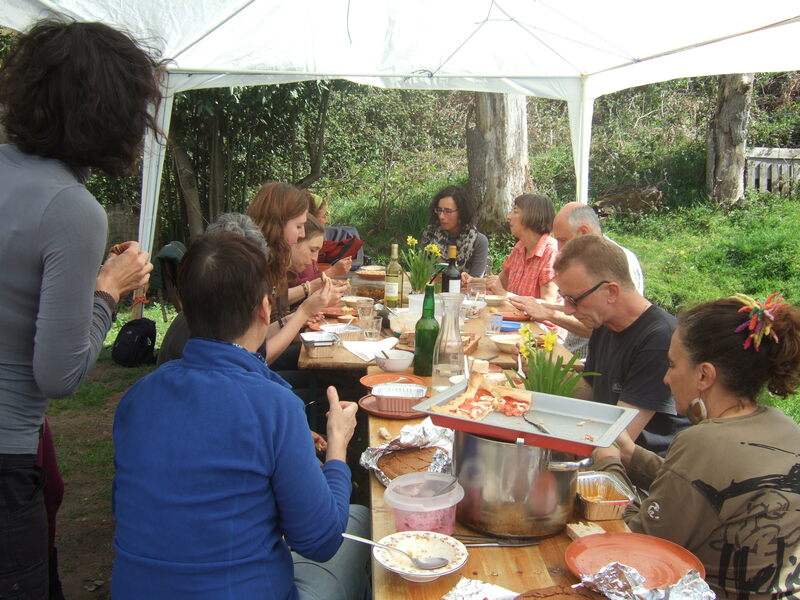 Volunteers enjoy a well-earned meal. Mmm, that apple smells really good. 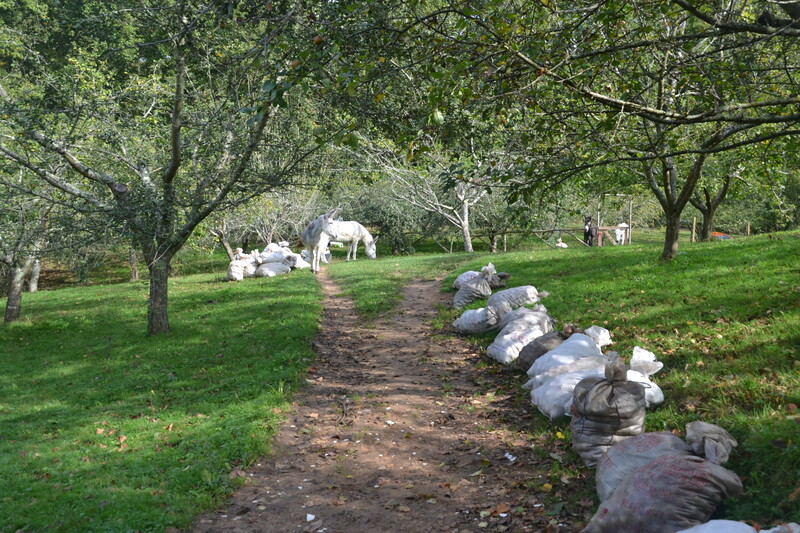 Bags of apples all in a row. Jesse and Simone piling the apples up in the village ready for collection. Phew! Finished at last. This photo says it all. 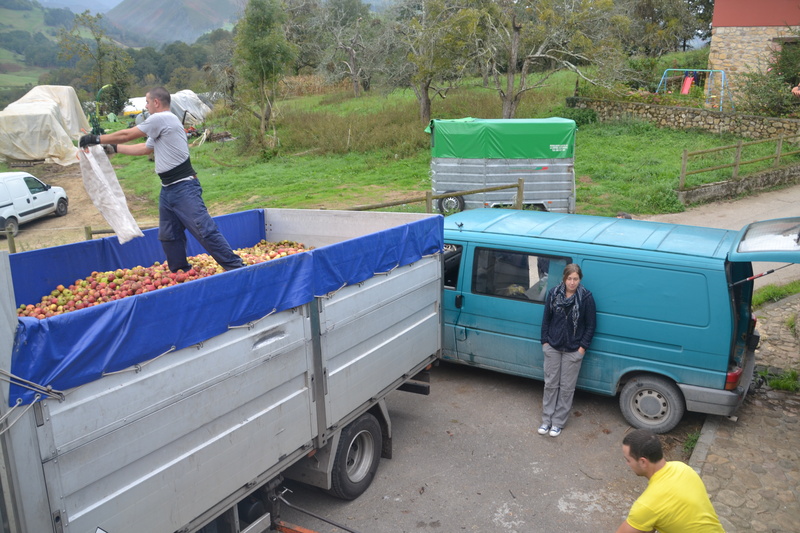 Apples are loaded onto the wagon for transportation to the factory. 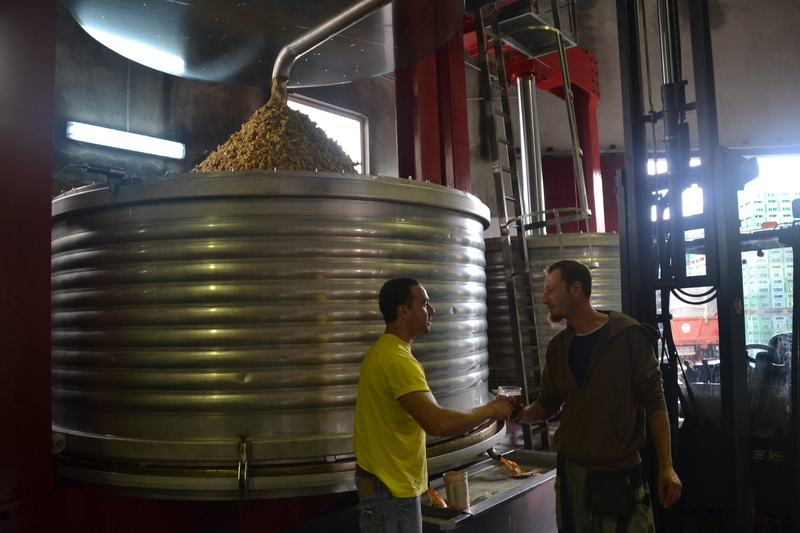 Cider tasting in the factory. It was all worth while! 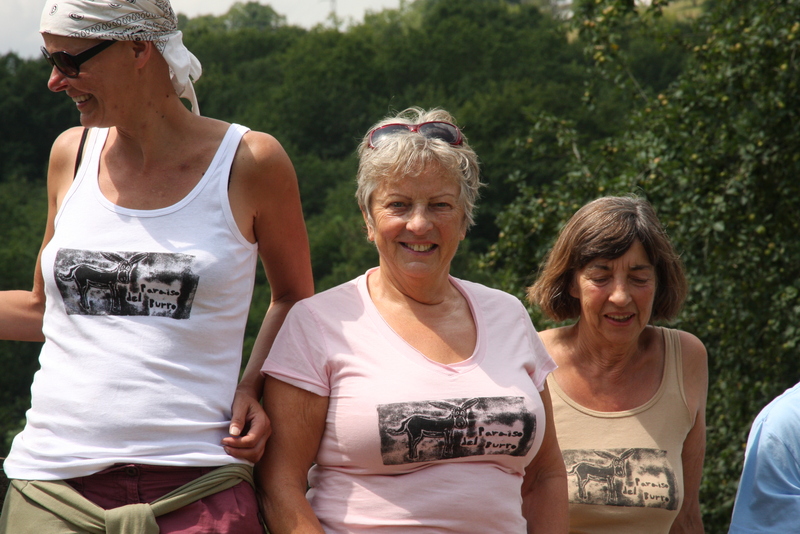 It has been a very busy couple of months at the Donkey Paradise, but luckily there have also been lots of wonderful volunteers from all over Europe, and beyond, to help with the work and activities. Also, Marleen was happy to have her daughter, Grietje, and her family over for a holiday with her and the animals. We have a lovely new donkey called Matias. He is quite old and unfortunately has not had a good life so he will need some care and attention but he already has a kind sponsor – Ria. He was very wary at first but he is responding to love and attention and he has the loudest bray which Marleen likens to the siren of a boat in the fog! 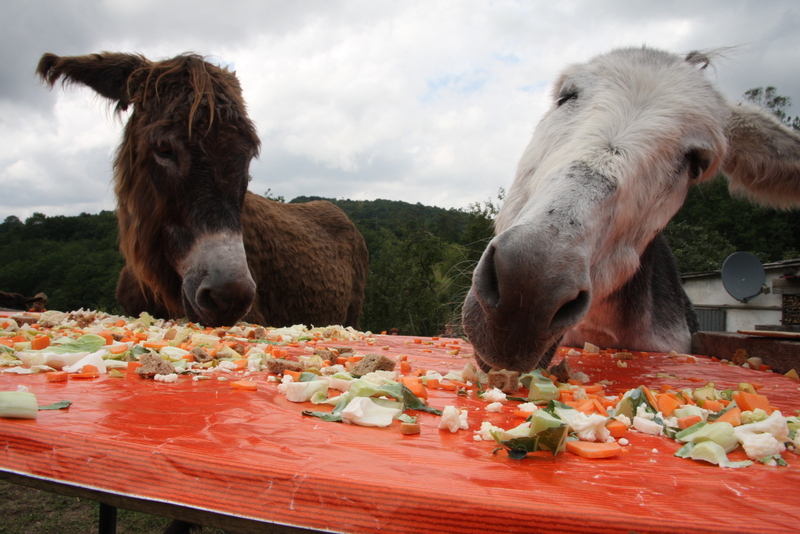 Some dear friends of the Donkey Paradise, Frank and Helma came again from Holland for their summer holiday, which is more like a working holiday. This time they brought with them an enormous trailer loaded with goodies – a beautiful wooden house and a car port. The car port will be used mainly as a shelter for the dogs as it can get extremely hot here in the summer months. Thank you to Helma and Frank and to those who helped them in the erecting of these buildings. 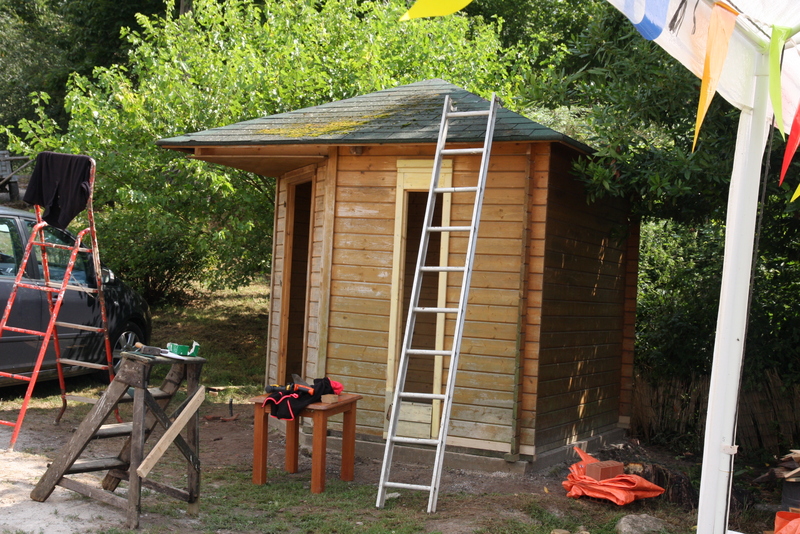 The summer house will have a special use – more about this in a later blog. 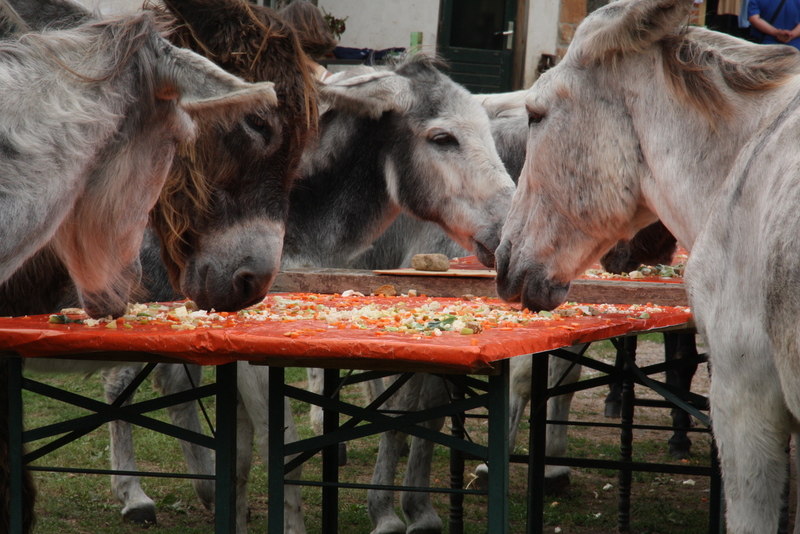 At the beginning of August we held our Open Day and this was well-attended and enjoyed by donkeys and visitors alike. Perhaps you can pick out some of the donkeys you know in these photos. Love for donkeys is not just a Dutch thing, judging by the volunteers in our Donkey Paradise who come from all over the world. 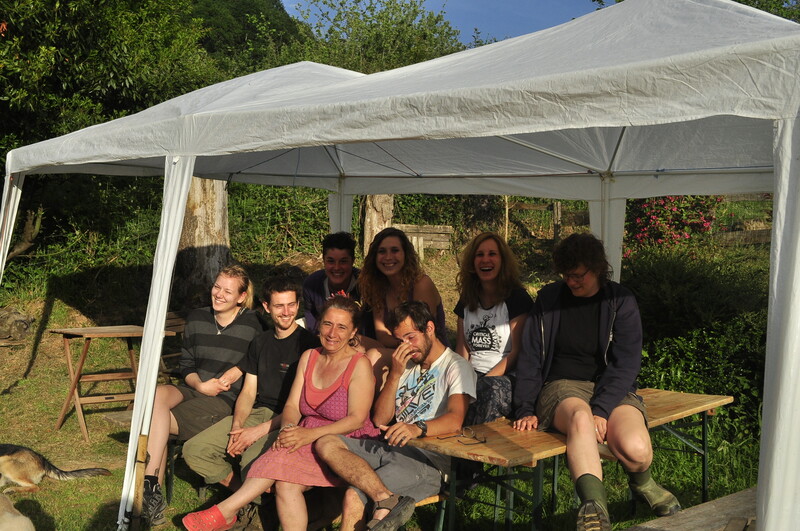 At this moment for instance we have volunteers from Spain (of course! ), England, Sweden, Hungary, Belgium, Italy and Venezuela. In the past we also had helpers from Australia, United States, New-Zealand, Lithuania, Finland and even China! It’s always a great experience to get to know people from other countries and cultures, although the language that we speak in the Donkey Paradise is sometimes a strange mix of everything! 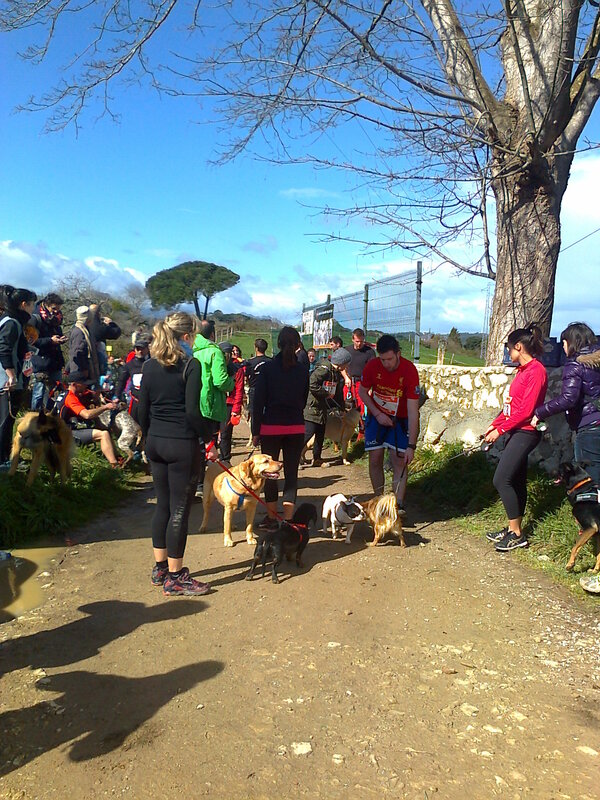 It was the last Sunday of March in Celorio, Llanes, in cold and sometimes rainy weather, when about 50 dog owners and their excited dogs ran the first CANICROSS of eastern Asturias. 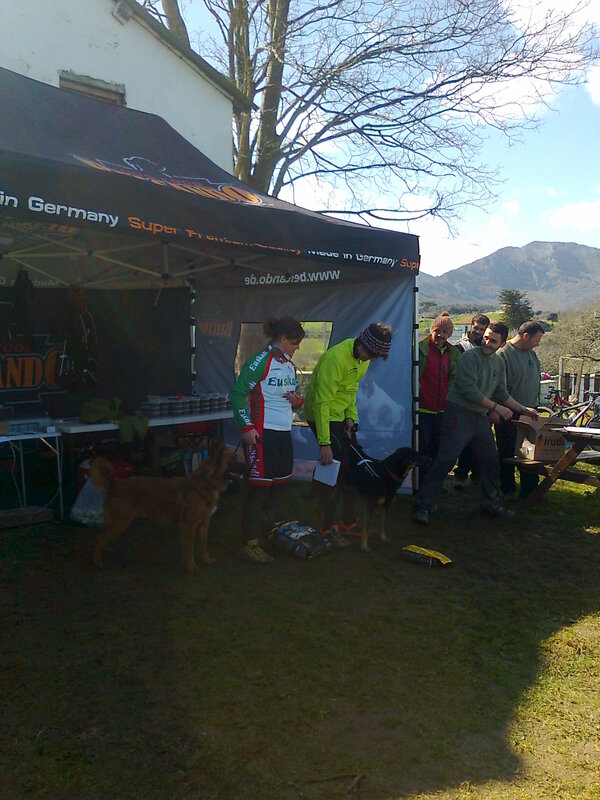 The couples ran over different distances and one event even involved cycling with a dog. 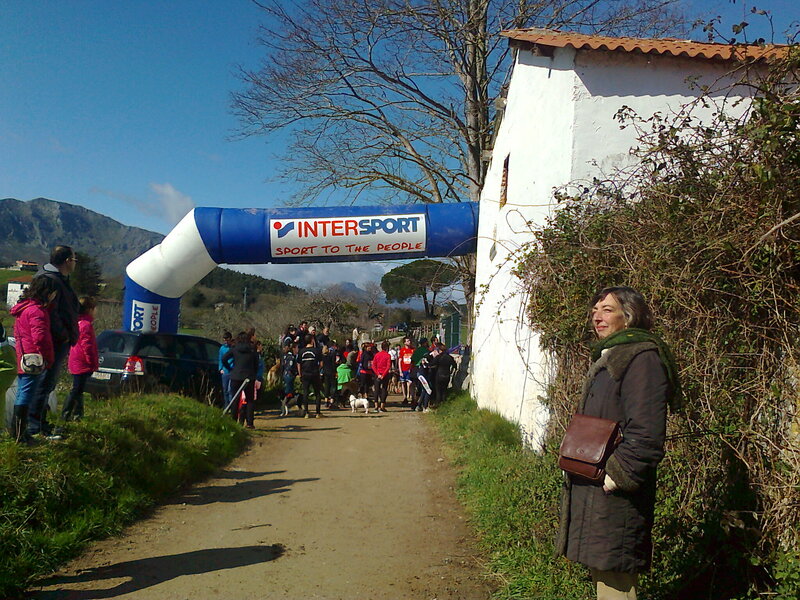 The event was closed after the final run, in which children ran with their pets over a distance of about half a kilometer. 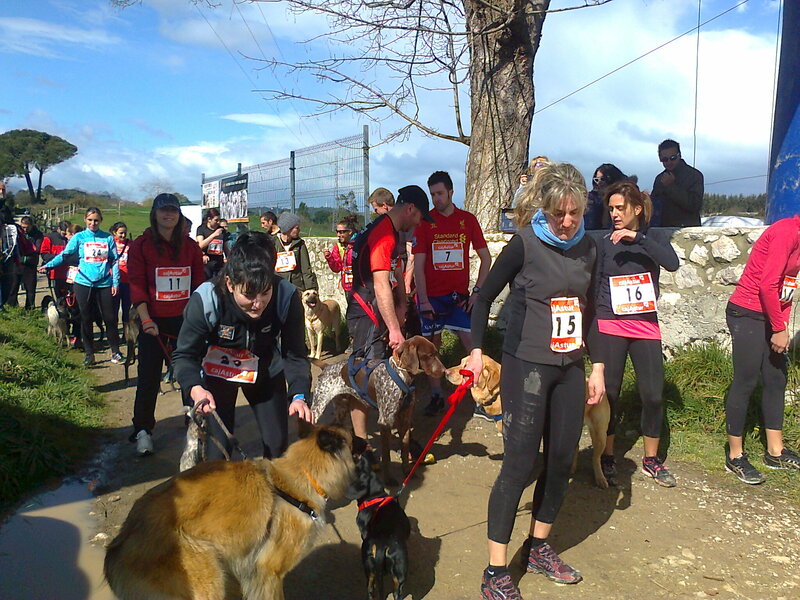 The “Llanes Canicross” was a charity event; the money paid for participation was destined for the donkeys of the Donkey Paradise. 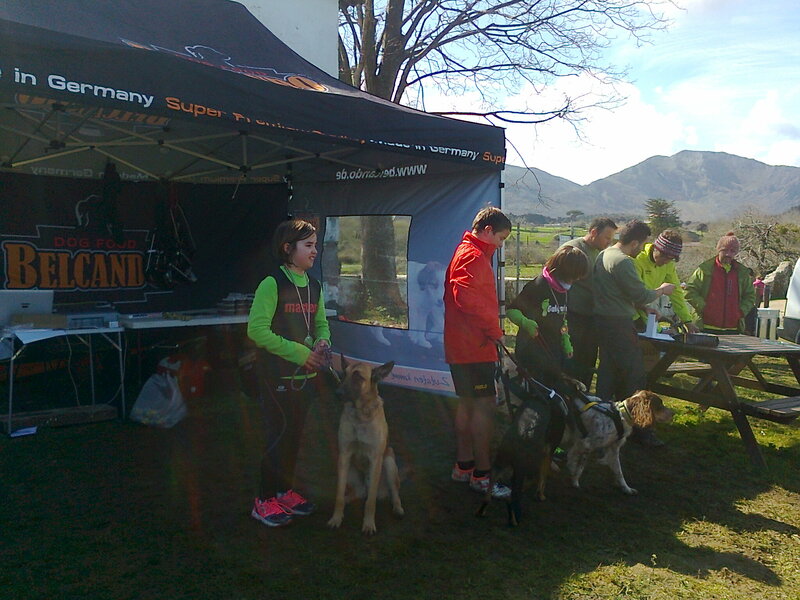 For this great initiative and the fantastic result, amounting to 350 Euros, we would like to thank the organisers and the participants – humans and animals – from our hearts! Thank you to Anuska for taking the photographs. 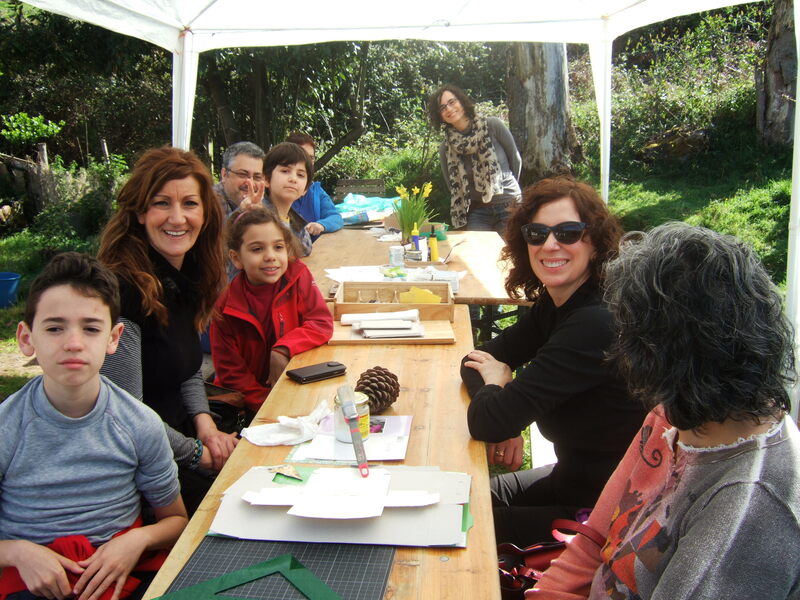 Sunday 30th March was a beautiful sunny day for the first “Art Workshop” to be held at the Paraíso del Burro. 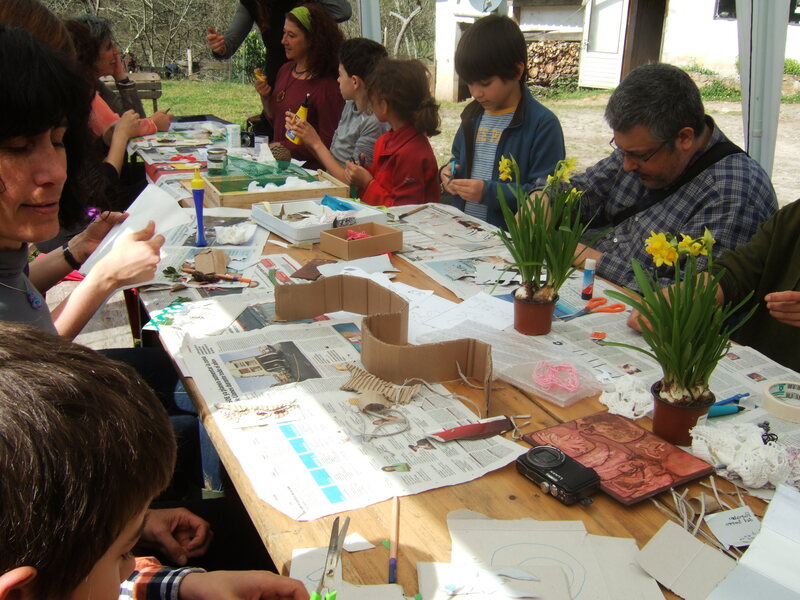 The event was a relaxed and happy affair with a mix of adults and children taking part. 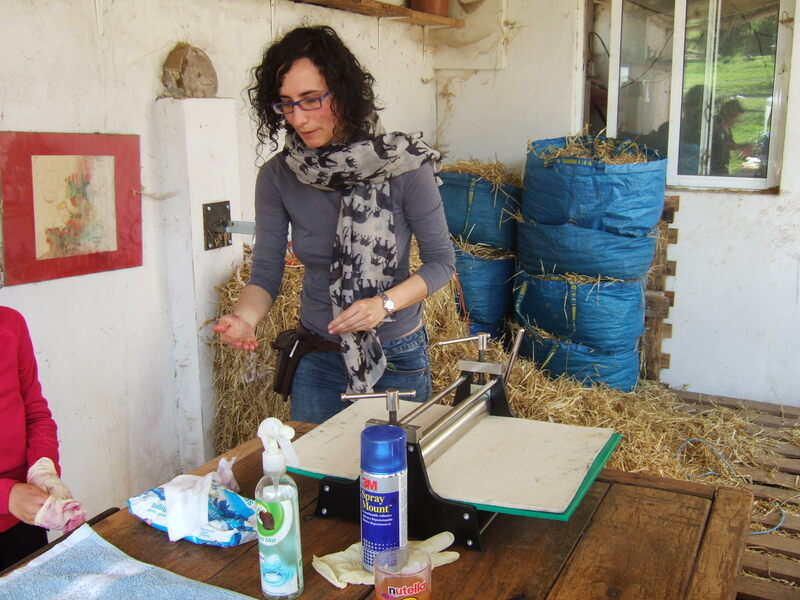 The event leader was Lydia who demonstrated the techniques needed to create and print some wonderful pictures, mainly relating to animals and nature but totally personal and without the need for any previous experience. In the morning we learned how to create our pictures using a variety of materials which were glued into place onto thick card. Almost any material can be used: card, fabrics, ribbon, flowers, tea, coffee… You are totally free to let your imagination flow. 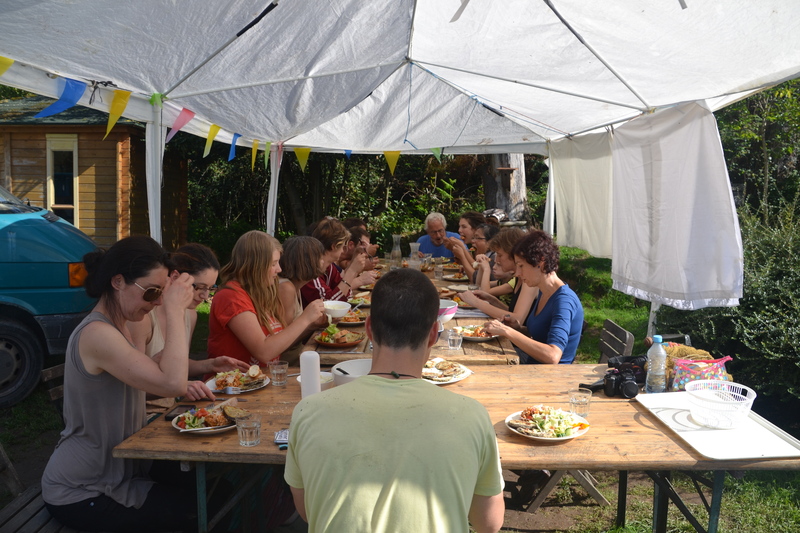 All work stopped for lunch and everyone enjoyed a picnic in the open air with a variety of food provided by all in attendance and shared between everyone – both volunteers and those attending the workshop. 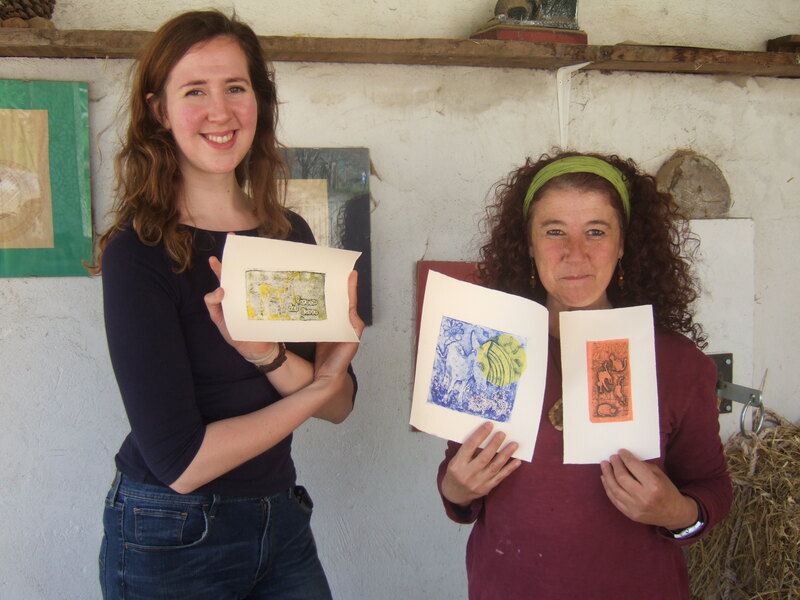 The afternoon session involved the printing of the prepared work and the revealing of the finished article. Once your picture has been created it has to be painted over with a water-based paint and prepared in readiness for printing. It is then covered with dampened printing paper and passed through the “press”. This was the most exciting part of the day for everyone as they peeled back the paper to reveal the finished article to gasps of amazement and joy. What a fabulous day we all had and grateful thanks go out to Anuska for organizing the event and to Lydia for supplying all the materials and demonstrating the techniques in such a clear and patient manner. The artwork will be on display and available for purchase at our next Open Day on Sunday 6th April from 12pm. Work has started again, after the Christmas break, on installing a new roof on the large barn which houses the food-store for the animals and the utility areas. During the holiday this area was covered by a large tarpaulin which thankfully withstood the high winds of the period. What a useful area this will be when the roof is finished and we will have a dry area for a change with no leaks in the roof. 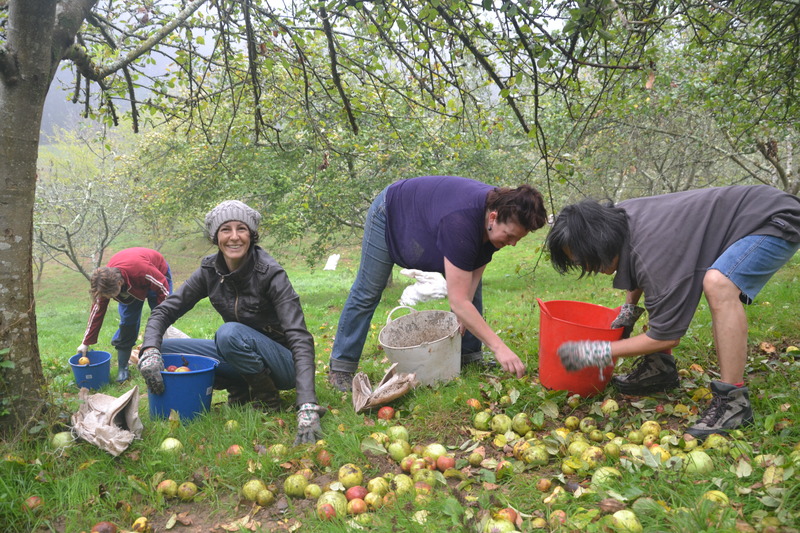 This work is funded by the sale of the apples from the apple trees on the land for the production of cider. 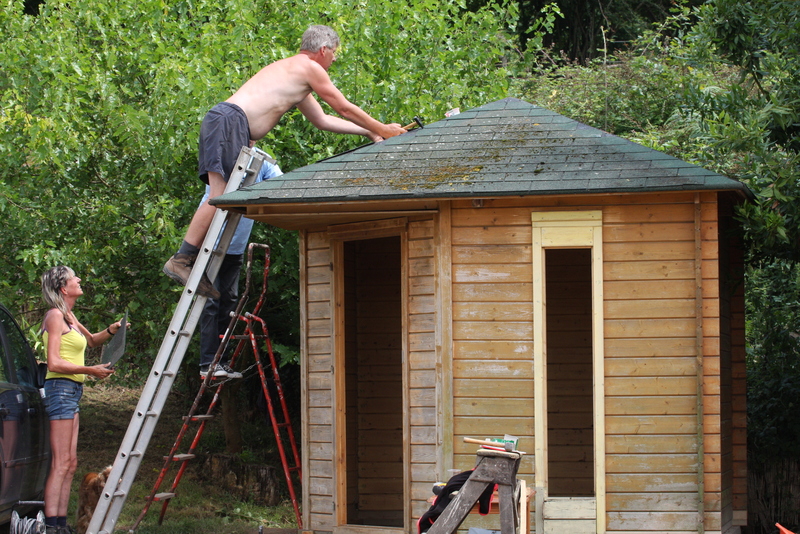 Thank you to Martin, the builder, and to volunteer Steve for all the hard work they are putting in. It is really appreciated. 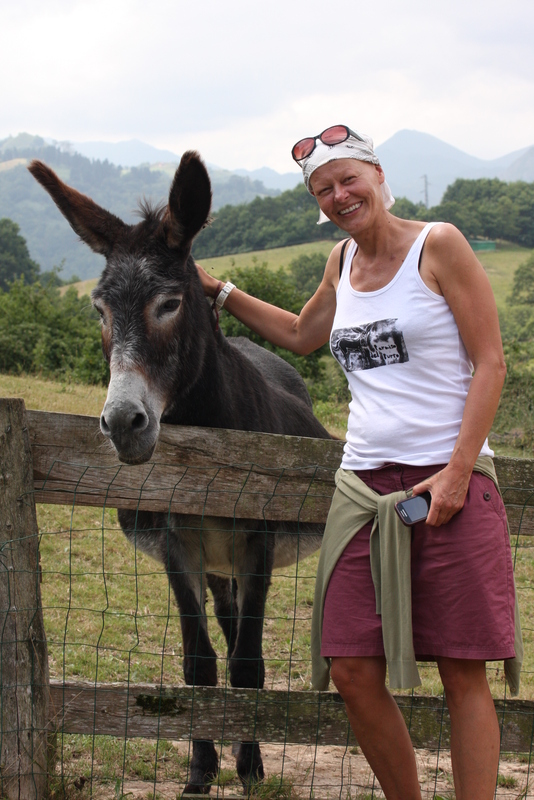 Caring for older and retired Donkeys in Asturias, Northern Spain.